If you look around the world today, you see that humans come in all shapes, sizes and colours. But we all belong to the same species, Homo sapiens, just as all dogs belong to the same species, Canis familiaris. That hasn’t always been the case: we once shared Planet Earth with other species of human – most famously with the Neanderthals. We first learned about these apparently vanished relatives of ours in the nineteenth century when an ancient skeleton was discovered in the Neander valley in Germany. Some scientists thought the bones were from our species, but closer study and the discovery of other skeletons revealed that they were from a distinct species, which was christened the Neanderthals (“Thal” is older German for “valley”). 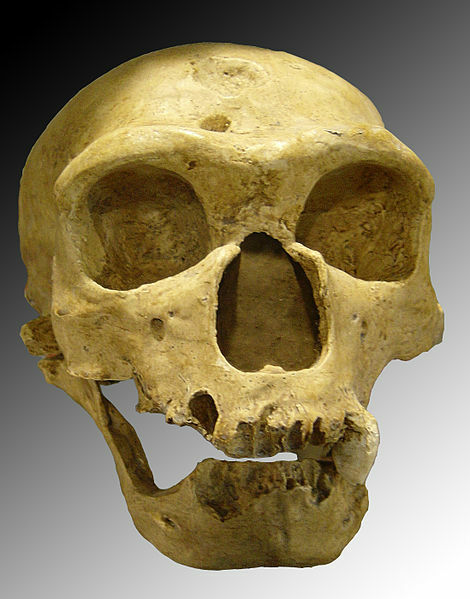 There was controversy about the Neanderthals for a long time. Some thought they were primitive and lacked language, others that they might have been the equals or even the superiors of modern man. They had died out, it appeared, but that might have been due to climate change or disease, not inferiority. And there was one very strong piece of evidence that the Neanderthals were human in more or less the same way as we were: they buried their dead and decorated the graves. Chimpanzees and gorillas don’t do that, because they don’t truly understand the concept of death and don’t have any thoughts about a spirit surviving when the body stops working. Thoughts depend on language, after all, and if the Neanderthals buried their dead with flowers and other offerings, that would seem to prove that they had some concept of an afterlife. We don’t know for sure, of course, because the Neanderthals died out long before the invention of writing. So did countless generations of our own species, but we can deduce their thoughts from their burials and grave-offerings. Graves and bones are mute witnesses to long-vanished cultures, evidence that human beings have believed in something beyond death for many thousands of years. Burial remains and huge structures like Stonehenge are the only way to reconstruct prehistory, or the period before writing. That used to be the case, at least. Then scientists discovered that there was more in the grave than they had previously suspected. If bones are buried under the right conditions, a special chemical called DNA will survive for thousands of years. DNA is the code for life and in a way it’s a kind of writing, because it contains instructions for the construction of a human body and everything that it contains. We’re still learning how that code works, but we’ve already discovered something amazing. Some Neanderthal bones contain retrievable DNA and by analysing that DNA scientists have discovered that the Neanderthals didn’t die out completely after all. Their DNA exists in living bodies – our living bodies. When our species left Africa, we met and interbred with Neanderthals, so that people of European and Asian descent have a small but significant Neanderthal inheritance in their genes. This hasn’t happened just once: there seem to have been several species of ancient human, like the Denisovans in Asia, and their genes seem to survive in some modern humans. It will be a long time before we begin to see the full story, but one thing is already clear: prehistoric bones can tell stories richer and more detailed than anyone dreamed when the first Neanderthal skeleton was uncovered.